Starting this Wednesday and through the weekend, extra caution should be taken on our roadways due to Thanksgiving holiday travel. While we always advocate driving carefully, sharing the roadways with holiday travelers and winter weather can present unique difficulties. 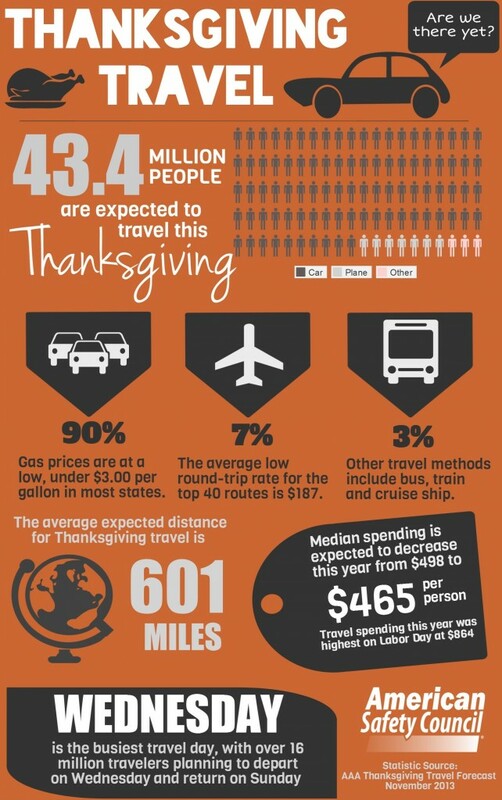 AAA estimates that about 43.4 million people will travel at least 50 miles over the holiday weekend, with around 90% of those traveling by car to their Thanksgiving destination. While this is still an extremely large number, this actually reflects a 1.5% decrease from last year’s 44 million travelers. Experts believe this is due to a sluggish economic recovery, but there is an upside to those looking to pinch pennies this holiday season – gas prices are at their lowest since 2010, with many states falling below $3.00 per gallon. More cars on the road mean more accidents; it’s just statistics. But to avoid being part of them, there are certain steps you can take to anticipate and prevent problems. In addition to the standard safety practices of always wearing a seat belt and always choosing a designated sober driver, here are a few things you should look out for while driving over the Thanksgiving holiday this year. Severe weather across the United States also poses a potential threat, both to safety and to travel times. These weather systems (and the accompanying icy roads, speeding cars and even falling trees) have already contributed to at least 10 traffic fatalities and thousands of flights have already been canceled or postponed in the central United States. Areas in the Eastern US are expected to receive up to 12 inches of snow from a system that has already lashed New Mexico and the southern Plains with snow and ice. Heavy rain is expected to fall from Texas to Florida and up to the Carolinas on Monday night, with some sleet and snow possible in northern areas. Most people (37% of all travelers) are expected to start their holiday travel on Wednesday and make their return trip on Sunday (33%) or Monday (24%). Thursday evening and Friday could have their own congestion, though, with many Americans taking part in Black Friday shopping excursions. Sharing the road with large trucks can be nerve-wracking. Be aware of their blind spots; if you can’t see their mirrors, they can’t see you. Remember that trucks are heavier and take longer to slow down or stop, so make sure to leave plenty of space if you are changing into a lane in front of them. Road conditions can change quickly due to congested roadways or inclement weather, and speeding can become especially dangerous. Trips will take an average 26% longer than normal on Wednesday, but do not speed to make up for delays! Slow down and give yourself plenty of time to get to your destination – even if you get there early, you won’t feel stressed or angry if you experience delays. Road rage is another cause of accidents, so remember to stay calm. Before you jump onto the highway, know your route and your exits. Even if you have a navigation device or a reliable co-pilot, you will feel more comfortable if you know the overall route. Last-minute lane changes due to unfamiliar roads are often a cause of holiday travel accidents. Before a long road trip or any trip in inclement weather, make sure your car is in good working order and you have packed your car with emergency supplies like blankets, water, snacks, a flashlight and a first aid kit. You should also make sure to fill your fuel tank (and do research on gas stations if you are driving through any remote areas), top off any fluids and check the air pressure in your tires. Distracted driving is one of the largest causes of collisions and accidents – even two seconds of talking on the phone, checking the back seat, sending a text message or unwrapping a snack can double the chance of having an accident.